Payment Plans are available for an additional fee of $100. Click HERE for more details. Roots of Tantra (100hr) is one of two modules that make up The Wild Temple School of Yoga + Herbal Wisdom’s 200hr foundational yoga teacher training course. Students who take this module along with Yoga of Ayurveda (100hr) may be certified at the 200hr level through Yoga Alliance. In this module, students will dive deeper beyond the basic framework and foundational practices offered in most yoga trainings, to explore the energetics of asana, and how to craft a wisely sequenced, teachable practice, as well as be supported and encouraged to maintain a daily home practice. Classes run every Tuesday 10am – 5pm from March 12th – May 21st. 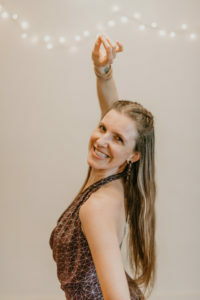 Wild Temple Yoga is a unique and powerful comprehensible Yoga Alliance certified Yoga Teacher Training (YTT) that is broken up into 5 digestible 100hr modules offered throughout the year. Rooted in The Himalayan Sage Sri Vidya Tantra Tradition, Brooke Sullivan, teacher and founder of The Wild Temple School, weaves ancient techniques of living traditions into the modern life and mind. She draws from Yoga Science, Tantric Philosophy, and Botanical Wisdom to provide a profoundly integrative and deep training. Wild Temple Yoga teaches about love, faith, and power in a non-dogmatic format, where interactive discussions are the highlight and students can discover and begin to embody what is True for them, in relation to topics such as power, oneness, fear, the monkey mind, dharma or one’s life path, right/wrong, emotional and physical health, Source consciousness, etc. The practices and course topics are designed to awaken each student’s own empowered self and inner teacher, leading them into successful lives with rich relationships and the strength to shift unhealthy habits with an increased capacity for patience, love, and compassion. Wild Temple Yoga is dedicated to anyone interested in self-transformation through the yogic path and/or becoming a yoga teacher. Students who journey down the Wild Temple Yoga path will be guided deeply, safely, and effectively, towards becoming advanced practitioners and teachers. For more information on our programs, please click HERE.